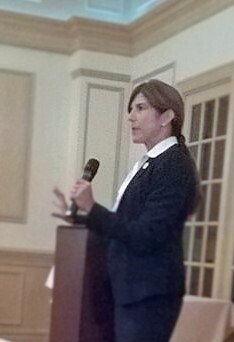 May 6th, 2015 – The first excerpt of Guest Speaker, Senator Jennifer Beck of the New Jersey Legislature representing District 11, comments at the April 27th Freehold Township Republican Club meeting. The Senator presented and answered questions regarding expected poor voter turnout for the upcoming election; the impact of public employee pension and health benefits on the NJ budget; funding the Transportation Trust Fund and potential of a gas tax; education reform and more. Senator Jennifer Beck stood for well over an hour to the largest turnout in quite some time. Unlike the turnout for this meeting, she began her comments with concern of the “oddness” of the upcoming election season. Reminding the group that during the 2011 election, when redistricting created the new district 11, she, Mary Pat Angelini, and Caroline Casagrande faced a low 28% voter turnout. This time however, with the State Assembly leading the ticket, only a lower 20% turnout is expected. Those highly educated and followers of politics expect a negative aura for Republicans considering the usual polling levels of a governor’s 6th year at the close of his office and press reporting of the Bridge Gate indictments over the summer. The best results in raising turnout would be a campaign strategy targeted to encourage citizen voting, those who voted in the last 3 or 4 general elections and the handful of individuals who have special interests. Senator Beck offered her readiness to assist candidates both financially and with her traditionally effective walking tours to meet their respective constituents. In addition, of the “three things most often” making the press recently, she began her remarks regarding the growing budget. As a member of the Senate Budget Committee, she is acutely aware of the issues. The Senator indicated that while the state government has grappled with two billion less discretionary dollars since the 2008 budget, overall it is still growing “completely due” to obligations of providing pension and health benefits to New Jersey public employees. New Jersey’s “Platinum Plan” makes it the 3rd richest health benefit plan in the country. In addition, the Northeast’s medical expenses are high and contribute to the extraordinary cost. The average yearly price of the public employee’s family plan is between $26,000 and $36,000, with the vast majority funded by tax payers. While understandably complaining when the reality of their contribution increases hit after the 2010 benefit reforms, they “don’t come close” to what private sector employees contribute. Further, should a full pension payment be made to the public employees plan, and the required funding of the healthcare program, 23% of a thirty-four billion dollar budget will “just go to funding” benefits. And the “scary thing” is that’s almost a quarter of the budget. “It is not sustainable” according to Senator Beck. We are headed to a day when the pension can become bankrupt, and as such, they will say “we are going to give you 25 cents on the dollar”. The Senator is “disappointed the teacher’s union walked away from the table” in spite of “a road map we had started to discuss.” The road map kept current employees to what they had, and a reviewed potential different tracks in terms of changing retirement and health plans going forward. We can work together to fix it for the almost 500,000 active and retired employees, or it will resolve itself. “It could come to employees relying on certain pension dollars”, that “it is not going to be there”. This year $1.3 billion will be put in the budget as a pension payment. Senator Beck doesn’t believe it fair to blame Governor Christie for the problem when he has funded the pension at the highest level since any of the last five governors. While the court did not order the payment be paid for the last year, it has directed that the problem of funding be figured out by going back to negotiate with the public employees union. In spite of attempts, as of last week the state was sued to fully fund the pension at $3.3 billion. The Senator expressed that “it just doesn’t exist”. She stated that even should the millionaire’s tax be raised, it would only bring in only $600 to $700 million, and she wasn’t sure where the additional $2.7 billion would come from. That thinking is “folly” and she has difficulty understanding the “lunacy” of representatives of the state legislature, Senate President and the Assembly Speaker, as sponsors of the budget, joining in the law suit against the state of New Jersey. While putting the budget together, they are suing themselves, which adds to the current “chaos”. But have faith, they will be working to resolve this as in many others state’s and municipalities are grappling with similar issues.